Adafruit Industries is proud to be featured for New York in @Google’s 2015 Economic Impact Report #EconImpact15 « Adafruit Industries – Makers, hackers, artists, designers and engineers! 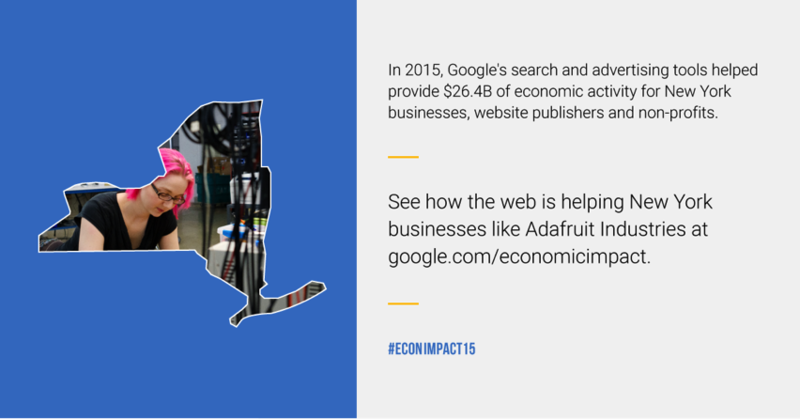 Adafruit Industries is proud to announce that we have been featured in Google’s 2015 Economic Impact Report! Read about our business and learn more about how the web is working for us and other New York businesses here. Adafruit started using AdWords, Google’s advertising program, in 2012. It now accounts for a third of the sales in their online shop, which is a Google Trusted Store. Adafruit uses Google Hangouts and their own YouTube channel to share tutorials and videos. “We post every day on YouTube, to show what’s happening behind the scenes at Adafruit,” Limor says. “It’s not just about how to use what we’re offering, but how we make it.” They use YouTube as well to stream a live weekly program called “Ask an Engineer.” Google Groups helps them build a strong online community, and their Google+ page has over two million followers. View the report here and as a PDF here!